Separate registration is required for mobile workshops and space is limited. Prior to the quarterly public meeting of the Transportation Services Local Coordinating Board (LCB), members of the public are encouraged to participate in an annual Public Hearing. The Public Hearing will begin at 1:30 PM, and the regularly scheduled LCB meeting will begin at 2:00 PM. This hearing is an additional opportunity for members of the public to ask questions and comment on the Palm Tran Connection paratransit door-to-door services and Palm Tran fixed route bus services as they relate to the needs of Palm Beach County's disabled and transportation disadvantaged population. The Transportation Disadvantaged Local Coordinating Board (LCB) is administered by the Palm Beach TPA. For questions, contact Alyssa Frank at AFrank@PalmBeachTPA.org or 561.478-5744. As has been the practice in past years, the Palm Beach TPA will coordinate a group bike ride into downtown West Palm Beach and will participate as an exhibitor in the City Hall courtyard to celebrate Bike-to-Work Day on Mar. 15. Click here for the details and route of the group ride from the north, coordinated by the TPA. Watch for upcoming details on additional group rides into downtown and related events. 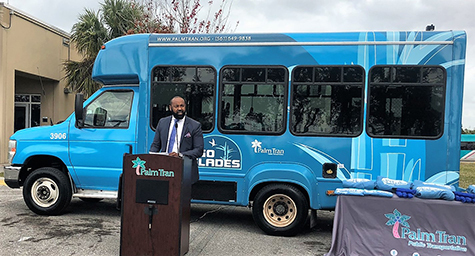 Palm Tran has introduced flexible transit routes for Belle Glade, Pahokee and South Bay with its new Go Glades service. Palm Tran Executive Director Clinton Forbes presided over a ceremonial event held in Belle Glade on Jan. 23. Contact Joe Harrington of Palm Tran at JHarrington@pbcgov.org or 775.848.9062 for additional information.